Recently a 1963 Gibson Country & Western acoustic guitar was taken into the workshop for a Workbench Assessment. 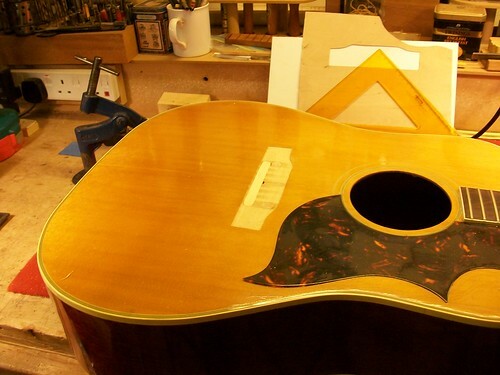 The guitar was brought in because the client felt that it wasn’t quite as it should be. On inspection it is very apparent that a new bridge has been fitted. Whoever had completed this upgrade had made a neat job; it’s made of Rio Rosewood and fitted “belly-up” in the style of its original. The client suspects that the guitar’s intonation isn’t as accurate as it should be. 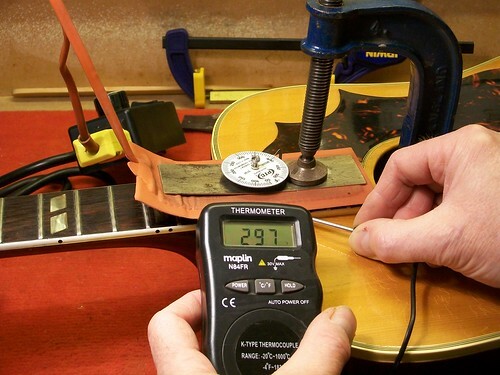 And sure enough on measuring the string length it is incorrect by 4mm. This discrepancy is too excessive to be able to make an adjustment to the saddle or the saddle slot. 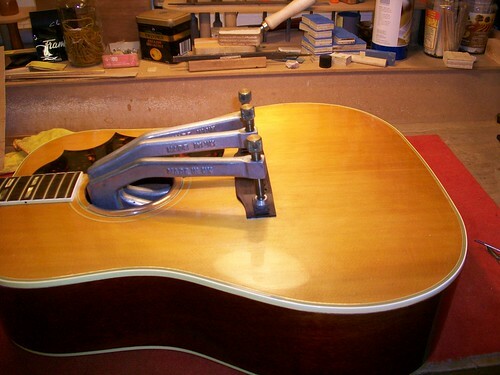 The only option is to make a new bridge in the style of the old one and position the saddle slot correctly. It is also a chance to resolve a few more of the problems found on the guitar. The bridge-plate is looking a little battered and worn and shows signs of realigned holes and repairs. 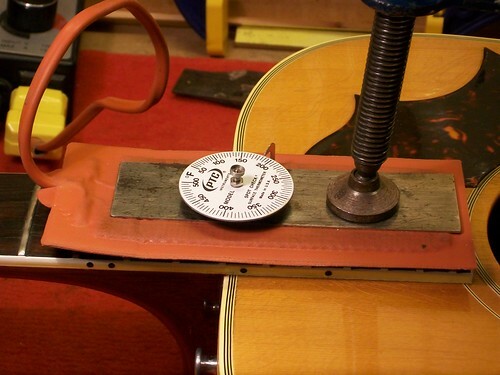 The guitar neck has been reset at some point, but the fingerboard has not been glued back in place correctly as there is a crack between the fingerboard and body, as detected by this feeler gauge. 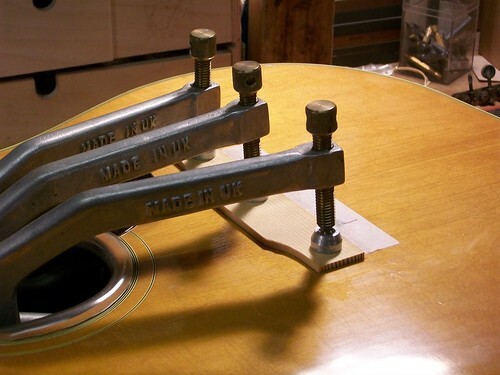 The bridge is removed; this reveals the footprint to the old Adjustable Bridge System that Gibson used during the ’60s. This also reveals some of the old repairs and doweled holes. These dowels are drilled out in an attempt to remove the bridge-plate. Unfortunately the bridge-plate will not yield and remains immovable. 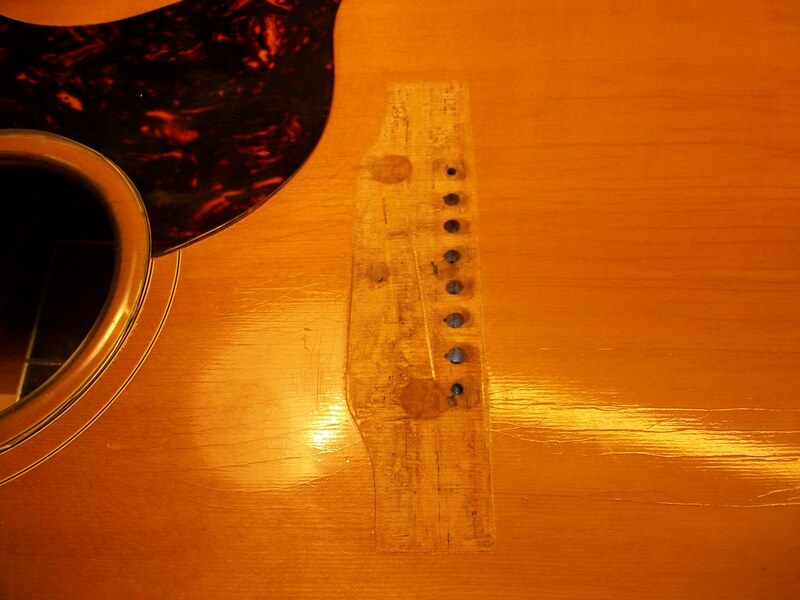 This is unusual in any acoustic guitar and leads me to believe that the earlier repairs have caused this. 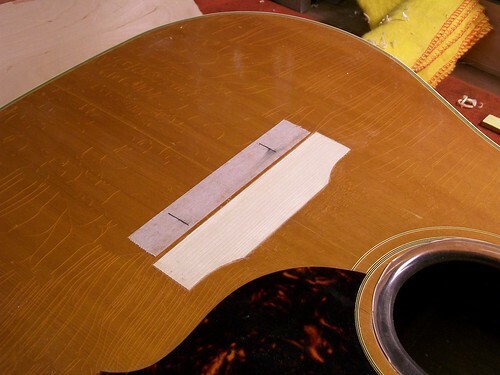 Since the bridge-plate cannot be removed and the bridge-pin holes cannot be repaired internally using a Specialist Inlaying and Cutting Tool, the only course of action is to rout through the soundboard and through the bridge-plate (don’t try this at home folks). This removes the worn and damaged section of the plate. 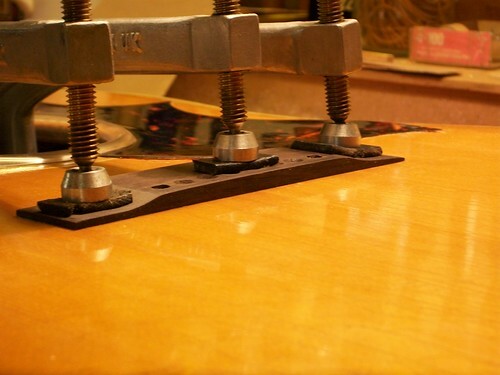 A section of Spruce and Rosewood is made up as a laminate. This is then inlayed into the tapered gap. A section of new Spruce is laid over the bridge footprint and levelled off. This gives the new bridge a flat and stable gluing area. Decorative Mother of Pearl dots are inlayed over the bolt heads. 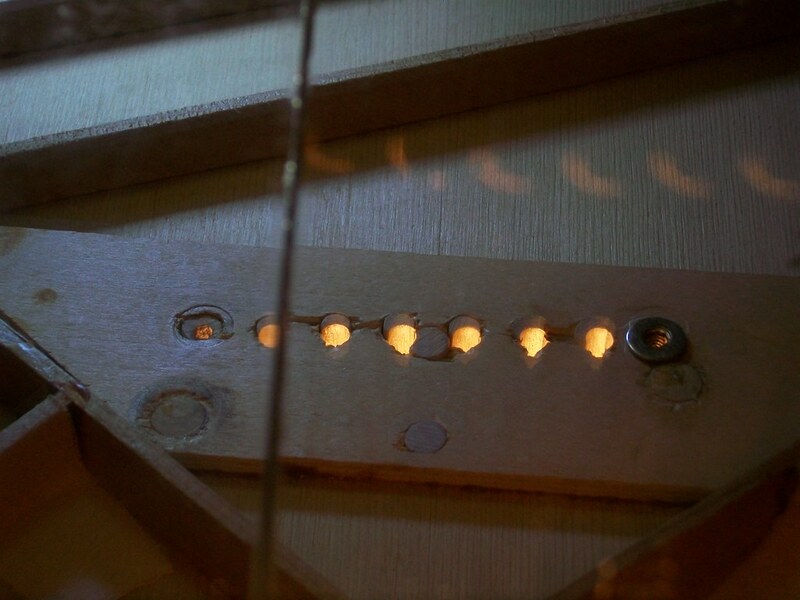 The fingerboard extension is heated. 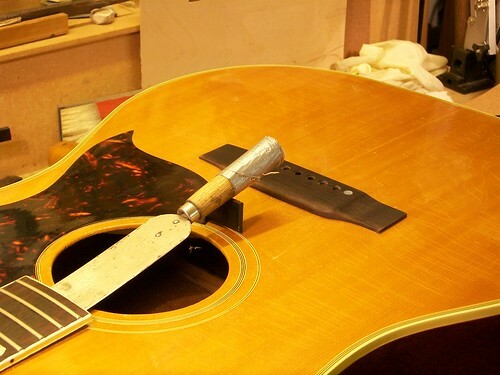 This releases the glue and allows a pallet knife to be inserted under the fingerboard end. 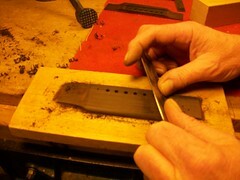 The knife is left in place while the extension cools; this prevents the glue from reattaching. 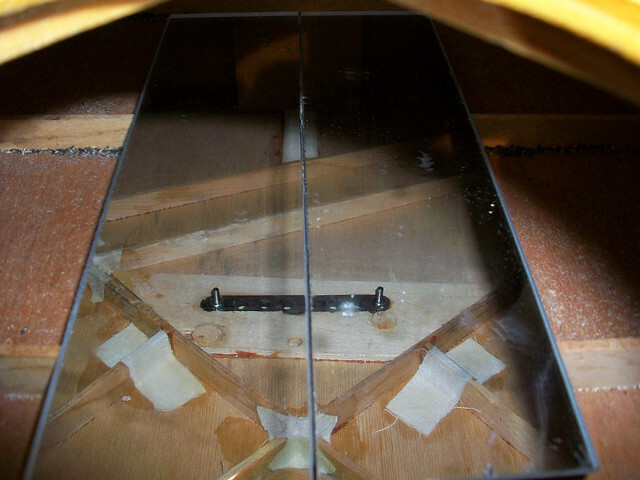 Hot glue is syringed into the crack and under the fingerboard extension. The whole area is clamped up and left to cure overnight. 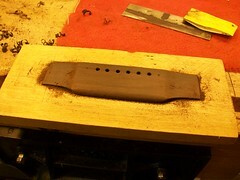 To cut a saddle slot in the new bridge. 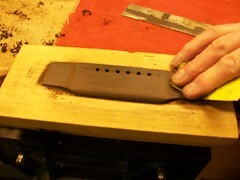 To make a new bone saddle and fine-tune the intonation. To make a new bone nut. 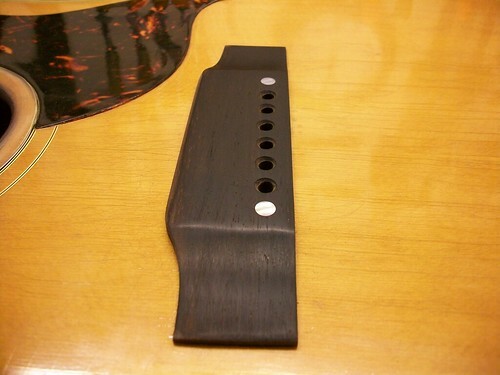 To Fret Hone and Re-profile the frets. 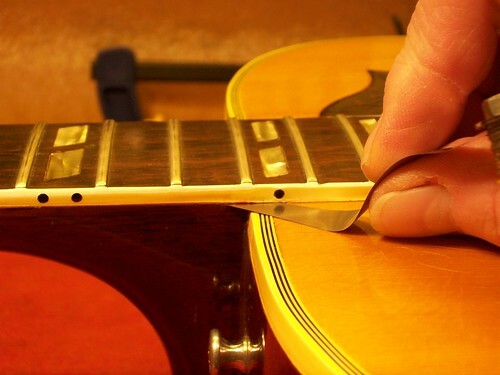 To restring with 12 – 53 strings. 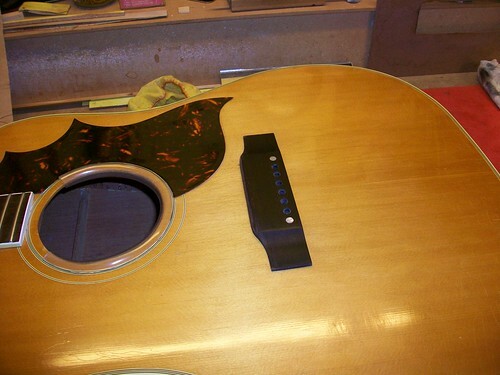 Click Here to view the finished guitar in it’s home setting. Also photos of the CW’s new tuners that have been authentically aged by it’s owner. Photos courtesy of the owner Richard, London, 2011. I don’t play my ’65 Gibson Country & Western a lot. I got it in ’76. I goes out of tune before a song ends! I thought it was the bridge, because everyone talks about that. Is that the common problem? I has Grover tuners. What can I try? I play the guitars I have and I want to play this more. Bring it into the workshop for a workbench assessment. It’s the only way to get to the root of the problem.